The Abbey Drain was rediscovered just over twenty years ago in the early1990’s. Prior to that it was last unearthed in the 1800’s. As part of the Doors Open weekends of 2009, 2010 and 2011 work was undertaken to uncover more about the drain. 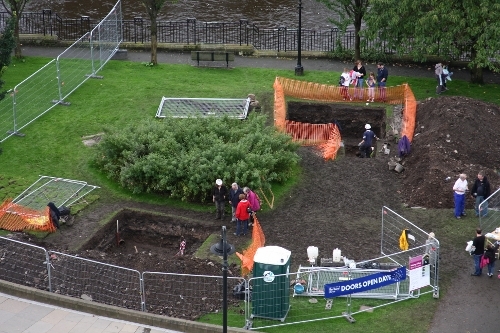 The archaeological digs which took place in the week leading up to Doors Open weekends, carried out by Guard Archaeology Ltd and the Renfrewshire Local History Forum. 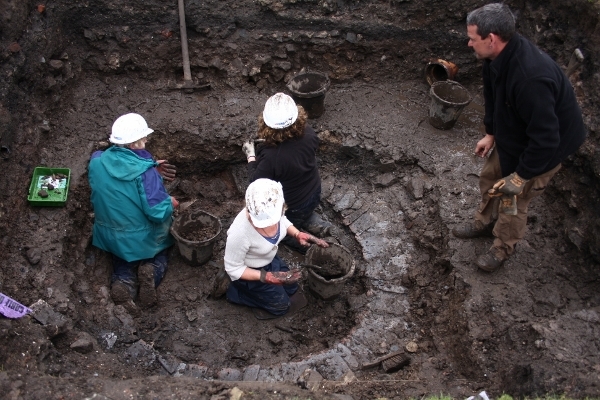 The 2009 and 2010 archaleological digs were aimed at discovering more about the outside of the drain whilst in 2011 the main aim of the dig was to find out why the drain did not run in a straight line. Two trenches were dug, one directly over the medieval drain and the other was dug on the straight line between the start of the drain and it’s end. 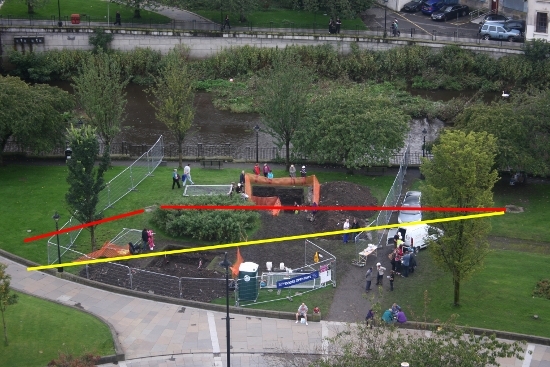 The photo above shows the actual route of the drain (red line) passing through Trench 1, whilst the yellow line shows the route if the drain ran in a straight line, which passes through Trench 2. The two trenches certainly did not disappoint. The first trench uncovered what appeared to be a cobbled path or road directly over the drain running alongside the river, whilst the second trench uncovered something even more surprising. 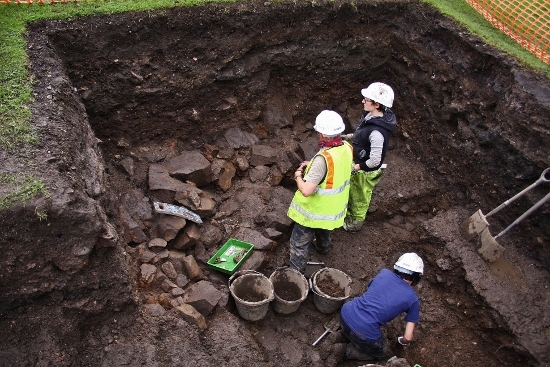 Trench 1 - uncovered stone cobbles, which can be seen in the photo above, just below the three buckets. these cobbles covered the whole area where the three archaeologists are standing/kneeling. Trench 2 uncovered a stone circle which was initially thought to be a well, but on further analysis may well have been a medieval oven which could have been in a building forming the Abbey kitchens. This would explain why the drain could not have gone in a straight line as it would have to have been built around this building.